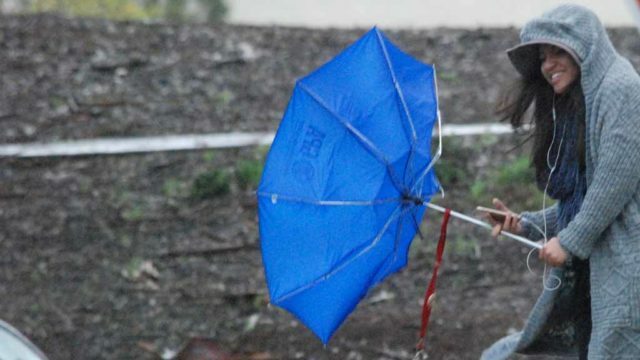 One more round of wet, wintry weather hit San Diego County early Tuesday, but the last in a series of storms is expected to move out of the region tonight. Snow could continue falling in areas down to around 3,500 feet and thunderstorms capable of producing lightning and small hail will be possible, but the rainfall is expected to lighten up as the day progresses and mostly clear conditions are in the forecast overnight, according to the National Weather Service. Forecasters anticipated the tail end of the storm would drop another inch or so of snow in the mountains Tuesday, along with .09 of an inch of rain on Palomar Mountain; .13 in Alpine and Ramona; .15 in Escondido and on Mt. Laguna; .25 in San Diego; .27 in Julian; .30 in Oceanside; and .31 in the Miramar area. Patchy frost is also expected to develop overnight in the inland valleys, which may kill sensitive outdoor plants if they’re left uncovered as temperatures drop into the 30s. A frost advisory will extend from 9 p.m. Tuesday until 8 a.m. Wednesday. Surf of 5 to 8 feet with sets to 11 feet and strong rip currents prompted a high surf advisory for the coast. In the past few days, three back-to-back storms contributed to several accidents, impassable roads and shuttered schools. Campuses in the Julian Union High School District, Julian Union School District, Mountain Empire Unified School District, Spencer Valley School District and Warner Springs Unified School District will be closed Tuesday due to inclement weather. Julian Union District schools will also have a late start Wednesday, according to the San Diego County Office of Education. On Monday, Gov. Jerry Brown declared a state of emergency for San Diego County due to the tens of millions of dollars in damage caused by the powerful storms. Brown’s proclamation also covers 49 of California’s 57 other counties. In a six-day period ending about 4 this morning, the storms dropped 10.91 inches of rain at the Palomar Observatory; 10.48 inches in Birch Hill; 10.10 inches on Palomar Mountain; 9.98 inches in Julian; 9.59 inches at Lake Cuyamaca; 9.20 inches in Pine Hills; 8.98 inches at the Henshaw Dam; 8.97 inches in Descanso; 8.74 inches in Mesa Grande; 8.64 inches on Mt. Woodson; 7.31 inches on Volcan Mountain; 7.30 inches in Santa Ysabel; and 7.24 inches in Rainbow, according to NWS data. Other rainfall amounts recorded over the same time period included 6.15 inches in Bonsall; 6.07 inches at Camp Pendleton; 5.90 inches in Alpine; 5.89 inches in Escondido; 5.83 inches in Fallbrook; 5.76 inches in Ramona; 5.42 inches in Valley Center; 4.98 inches in Warner Springs; 4.76 inches in Poway; 4.35 inches in La Mesa; 3.59 inches in Santee; 3.37 inches in Oceanside; 3.15 inches in San Felipe; 2.82 inches in Encinitas; 2.73 inches in Carlsbad; 2.60 inches in San Marcos; 2.56 inches in San Ysidro; 1.90 inches at Lindbergh Field; 1.07 inches in Borrego Springs; and .94 of an inch in Ocotillo Wells. Forecasters said drier and gradually warmer conditions are expected Wednesday and Thursday, with an even more pronounced warm-up Friday through Monday as high pressure aloft strengthens near the West Coast.